Atherosclerosis is a disease in which arteries narrow due to plaques. 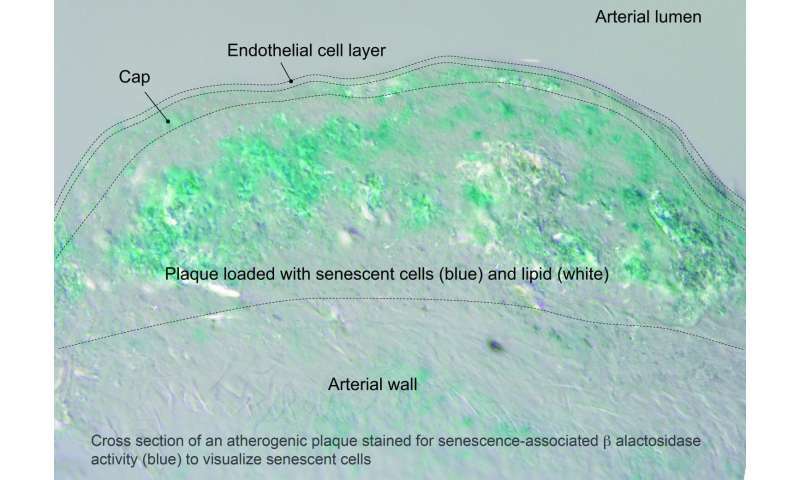 That narrowing can lead to heart attacks and strokes—both of which are leading causes of death in the U.S. Now, in a paper published in Science, Mayo Clinic researchers and colleagues show that senescent cells drive plaque formation in animal models of atherosclerosis. When stressed, healthy cells undergo senescence. In this process, cells are blocked from growing or dividing. The cells also release bioactive molecules called the senescence-associated secretory phenotype, or SASP. These molecules break down the normal tissue structure. They also attract immune cells that cause local inflammation. Healthy mice on a high-fat diet that promotes atherosclerosis develop plaque-promoting lesions within days. Bennett Childs, Mayo graduate student, the lead author of the study, found that these so-called "fatty streaks" contained many senescent cells. When mice were treated with a drug that selectively eliminates senescent cells, these fatty streaks disappeared within days. Fatty streaks progress to larger plaques through the recruitment of white blood cells from the circulation. Two molecules present in streaks and plaques, VCAM1 and MCP1, drive this process. Dr. van Deursen and the team discovered that senescent cells are responsible for the production of VCAM1 and MCP1 in plaques. Selective elimination of senescent cells in growing plaques resulted in fewer and smaller plaques. In advanced disease, plaques become unstable and are at high risk for rupture. That is a major determining factor in acute heart attacks and strokes. At this stage, senescent cells drove plaque growth. Senescent cells also produced enzymes that dissolve the fibrous cap that initially forms around plaques to provide stability. Selective elimination of senescent cells from mature plaques inhibited further growth of plaque and preserved the integrity of the cap structure and, thus, its stability. Based on their work, the authors conclude that senescent cells are key drivers of plaque formation and maturation.